AIRAH has established a group called the Women of AIRAH, to help promote diversity, representation and inclusion within the ranks of HVAC&R. 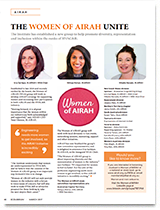 Established in late 2016 and recently ratified by the board, the Women of AIRAH (WOA) group will work to develop AIRAH’s strategy for supporting women and increasing their participation in both AIRAH and the HVAC&R industry at large. Diverse teams are proven to be more effective: they produce better financial results and better results in innovation. These results show that having a diverse organization is a business imperative. (The Data on Diversity 2014). While diversity is a vast umbrella, gender diversity is an area with great potential for growth within HVAC&R. This can also be considered an industry imperative, as AIRAH represents an industry body that seeks to continue to grow and innovate. Unfortunately, the gender gap remains wide, and women are still significantly and visibly under-represented in the HVAC&R industry. Boardroom and Firm Performance: What Exactly Constitutes a “Critical Mass?”, 2012]). The committee welcomes and encourages all advocates working toward gender equality and representation in the workplace and will engage in any constructive dialogue toward that end. This group is the national steering committee which will develop and drive initiatives to improve the entry and subsequent engagement and retention of women in the HVAC&R industry. Increase the number of female members in AIRAH to 30 per cent. Increase female participation in the AIRAH committees to 30 per cent at all levels. Highlighting the female role models within the industry and celebrating their achievements and contributions. Communicate the business case for diversity within the AIRAH and wider HVAC&R community. Provide guidance to the HVAC&R industry to develop a considered, integrated and approach to gender diversity and improving it. State Events – Presentations at forums, seminars, conferences and other industry events, workshops/networking etc. 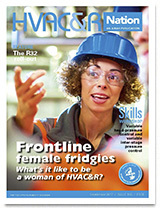 Development, identification and celebration of female leaders / role models / presenters in the HVAC space. Promoting diversity agenda within the AIRAH community. The Committee is responsible for its own administration including the preparation and circulation of minutes and agendas. Meeting minutes must be lodged with the AIRAH Executive manager – government relations and technical services. All committee positions shall become vacant on January 31 each year. The committee shall accept nominations from any interested AIRAH member. The Chairman/President and Deputy shall be elected annually by the committee members at the first meeting following January 31. The incumbent may re-nominate. If you are interested in being involved please contact Phil Wilkinson, the Executive manager – government relations and technical services, phil@airah.org.au. The committee will comprise a minimum of five members, with a chair and deputy chair elected from the committee membership. State committee chairs shall be referred to as State President. Membership is open to any financial AIRAH member. We have a dedicated Women of AIRAH group on LinkedIn. You can also follow all Women of AIRAH news on Twitter via #WomenOfAIRAH.